Marshall Bruce Mathers III (born October 17, 1972), better known by his stage name Eminem/Slim Shady is an American rapper and record producer. Eminem quickly gained popularity in 1999 with his major-label album, The Slim Shady LP, which won a Grammy Award for Best Rap Album. The following album, The Marshall Mathers LP, became the fastest-selling solo album in the United States history. The Marshall Mathers LP and his third album, The Eminem Show, also won Grammy Awards, making Eminem the first artist to win Best Rap Album for three consecutive LPs. He then won the award again in 2010 for his album Relapse, giving him a total of 11 Grammys in his career. In 2002, he won the Academy Award for Best Original Song for "Lose Yourself" from the film, 8 Mile, in which he also played the lead. "Lose Yourself" would go on to become the longest running #1 hip-hop single. Eminem then went on hiatus after touring in 2005. He released his first album since 2004's Encore, titled Relapse, on May 15, 2009. Relapse Part 2 was due to be released in 2010, but scrapped it due to media and fans and so he decided to release his latest album Recovery. Eminem is the best-selling artist of the decade on the US Nielsen SoundScan, and has sold more than 80 million albums worldwide to date, making him one of the best-selling music artists in the world. Eminem was ranked 82nd on Rolling Stone magazine's list of the 100 Greatest Artists of All-Time.He was also named the Best Rapper Ever by Vibe magazine. Including his work with D12, Eminem has achieved nine #1 albums on the Billboard Top 200, 7 solo and 2 with D12. Eminem has had 12 number one singles worldwide. In December 2009 Eminem was named the Artist of the Decade by Billboard magazine. His albums The Eminem Show, The Marshall Mathers LP, and Encore (in order) ranked as the 3rd. 7th, and 40th best album of the 2000-2009 decade by Billboard magazine. According to Billboard, Eminem has two of his albums among the top five highest selling albums of the 2000s. In the UK, Eminem has sold over 12.5 million records. 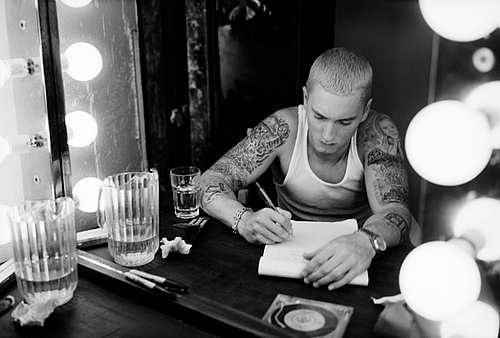 Subscribe to Eminem RSS Feed to get latest lyrics and news updates. What do you think about Eminem? Let us know in the comments below!